When The Streets of Carleton Place Ran Thick With the Blood of Terror! Smoldering ruins stretching over 4 blocks were all that remained after 30 buildings were destroyed as a result of one of the most disastrous fires in Carleton Place. The estimated total loss was over $200,000, and a section of the very heart of the town lied in ruins with one entire block wiped out. 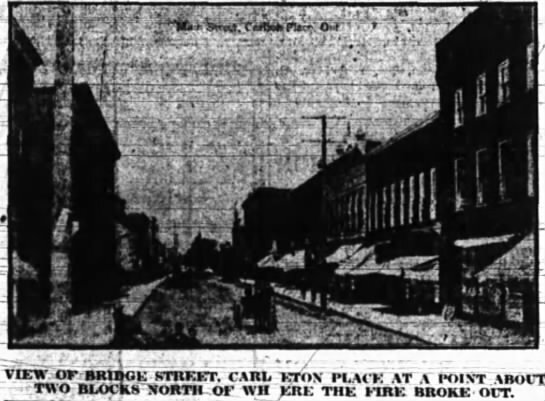 It was midnight at Cameron’s Butcher Shop shop on Bridge Street when the fire began from an unknown cause. As the fire, fanned by high winds blew from the south, it ravaged through the Siamese-twined buildings one after another taking no prisoners. The damage would have been much greater had the rain not begun to fall early in the new morning. Cecil Tetlock and W. Cram had just gotten off the train and gave the first alarm. Within minutes the entire population was “aroused” (the exact word The Ottawa Journal used). The Singleton block adjoining the butcher shop was soon in flames and the wind blew the embers on the neighbouring roofs. Soon a score of buildings were on fire. The firemen of Ottawa were busy fighting their own fire at home so they could not assist our Ocean Wave Fire Dept. 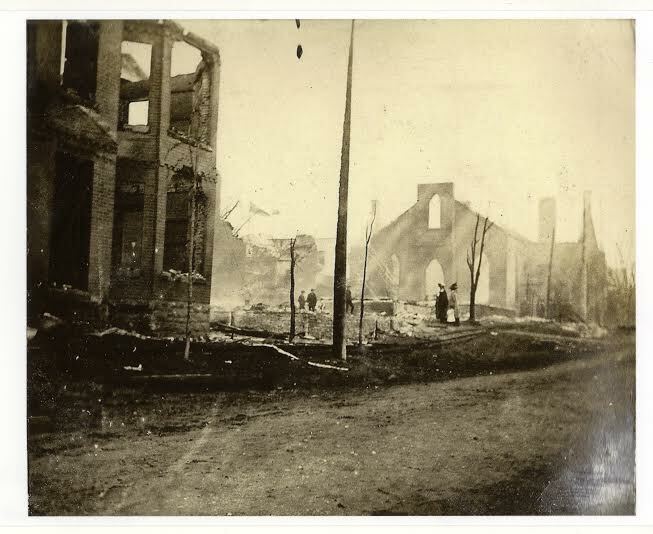 The Almonte brigade did not arrive until a greater portion of the damage had been done, no matter how hard they tried to get to Carleton Place earlier. Lord, how the flames roared! The largest individual loss was the residence of James Gillies (the present “library park”). The house which was built only three years previous was worth $25,000. 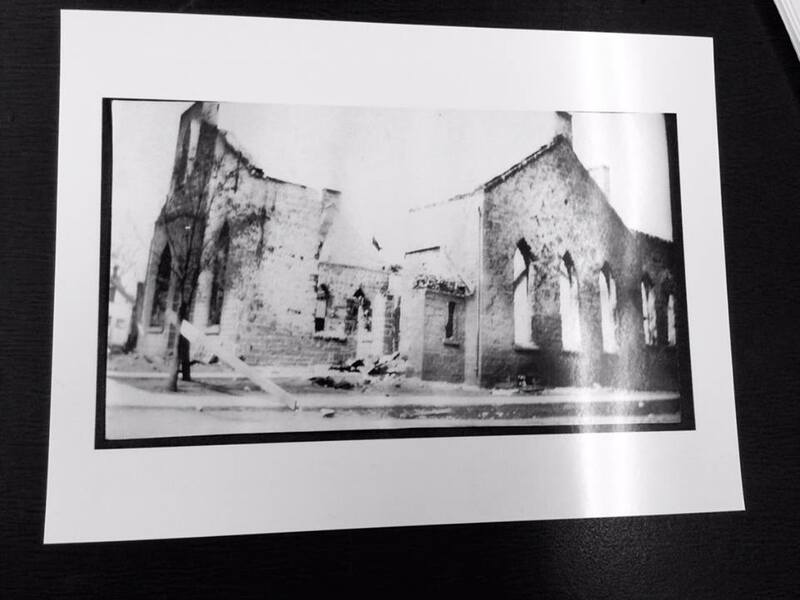 The Zion Presbyterian Church on Albert Street lay right in the cyclonic path of the fire and was completely destroyed. It was a heavy loss for the congregation; $35,000 with insurance only covering $16,000 of it. The building had also been renovated the previous year. Some residents of the destroyed home had practically nothing left, but the clothes they wore. The local fire brigade under Chief McIlquham could do nothing as they watched the Cameron Bros. Butcher shop and the Singleton Block burn. It was noted that the chief was sick and unable to walk, so he had to give orders from a horse-drawn carriage. Two engines were placed opposite the town hall near the river. When the fire jumped across Albert Street the steeple of the Zion church caught fire and although they fought the fire for hours; it was impossible to reach the steeple with local streams. The firemen had to walk back with their hats over their faces to reduce the heat at the Zion fire with Rev. Mr. Wilkinson rising to the top of the parsonage and with willing helpers who kept the building saturated with a tank in the upper flat and the windows were covered with blankets. Continuing due south, the flames crossed Beckwith Street and became more spectacular. On this street stood the curling rink and the armouries–all wooden structures. The building material being dry and combustible, spread destruction among the surrounding homes, resulting in the complete wiping out of the block bounded by Albert, Beckwith Judson and Franklin Street. On the north easterly corner sat the Gillies residence which was completely destroyed. Three young ladies residing in a house in one end of town were suddenly awakened at 3 am by the cries of fire and the illumination of the sky. They thought that Halley’s Comet had passed that night and had produced the end of the world. The three rushed outdoors in their night clothes waving their arms and crying in despair. They thought it the end of the time was near. It took awhile to get the ladies under control and understand what had really happened. No doubt they had read the newspapers that very day about the coming of Halley’s Comet. Although the fire was impossible to fight, the Carleton Place citizens came out to do what they could. Even though a special train had been sent to Almonte, the hundred feet of hose, an engine and firefighters could do little good when it arrived at 2 am. While the fire did not cross the river, the embers were lifted by the wind and hurled on to roofs which kept local residents busy. 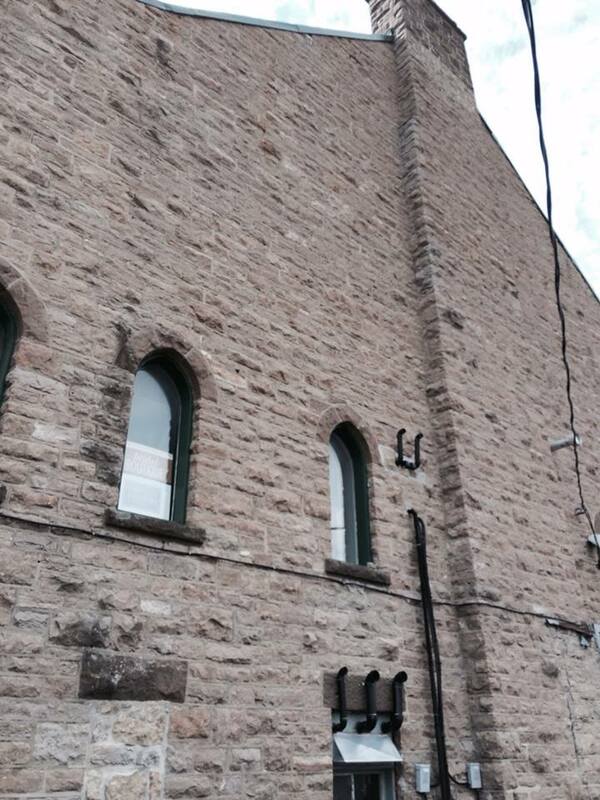 It even took a crack at the Bates and Innes Knitting Mill flag pole. As the newspapers reported the next day: it was an “off night” for sleep-so the next day was a holiday at many local factories to allow their employees to make up for sleep. Singleton block had a loss of $12,00 and their insurance was $13,000. The frame house of James Fraser had a loss of $1,500, and had a close call barely escaping with his children. Their insurance was unknown. The Masonic Hall and contents: loss $2,000- insurance $1700. The frame residence occupied by Mr. McNabb had a loss of $1500, and Norman McNabb had nearly been caught in the bell rope and strangled to death in sounding the alarm from the Zion Church. Mrs. Garland was hailed as being heroic for being on top of the roof of her brick residence. With the spirit of a fireman she poured water on her roof with her very own hands. In the end the firemen came to her rescue and saved her home. The stories are many with one newspaper making note that Mr. John Ferguson saved four suits from his house, but no underwear nor bedding. He had nothing left from his well-filled hardware store and workshop. Everything was lost including his Mother’s furniture stored in the upper flat. Howard Morton Brown said there were several narrow escapes. The most thrilling was that of Mr. Galloway, a Presbyterian clergyman who had preached the night before in the Methodist church and who was sleeping at Mr. McGregor’s. He is a cripple, and helpless in such a crisis. Mr. Howe, jeweler, and Mr. Hartley, book-keeper at the Shops, heard of his condition and rushed up after him. They grabbed him and carried him out, the roof falling in just as they left his room. The list of losses went on. The only thing that was left standing in the block bound by Beckwith, Albert, Judson and Franklin was a piece of latticework in the rear of Mrs. Gillies house. Of course it was noted that thieves took advantage of the fire and many articles saved by the fire were lost afterwards. The next day rain poured over the town as residents viewed what was left. 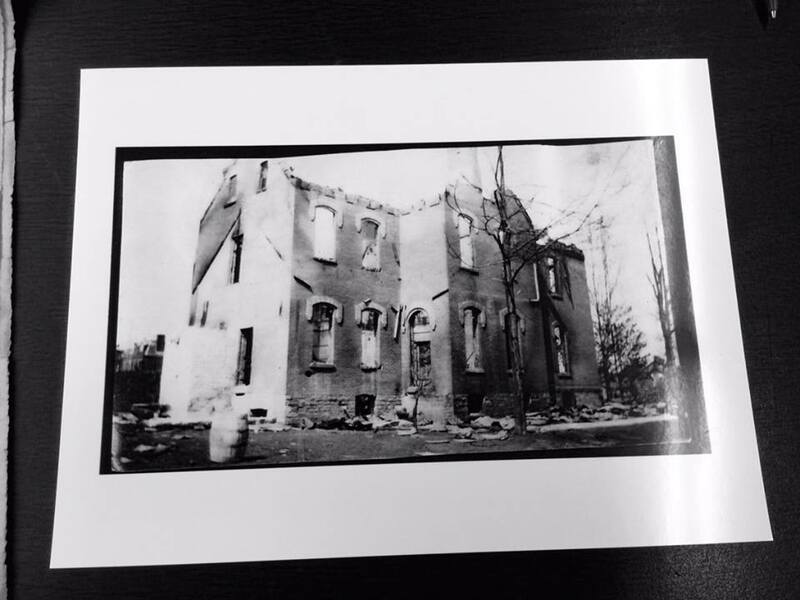 The only thing that remained of Zion church was the back wall that still stands today. If you look closely you can see many marks where the fire tried to destroy it completely. 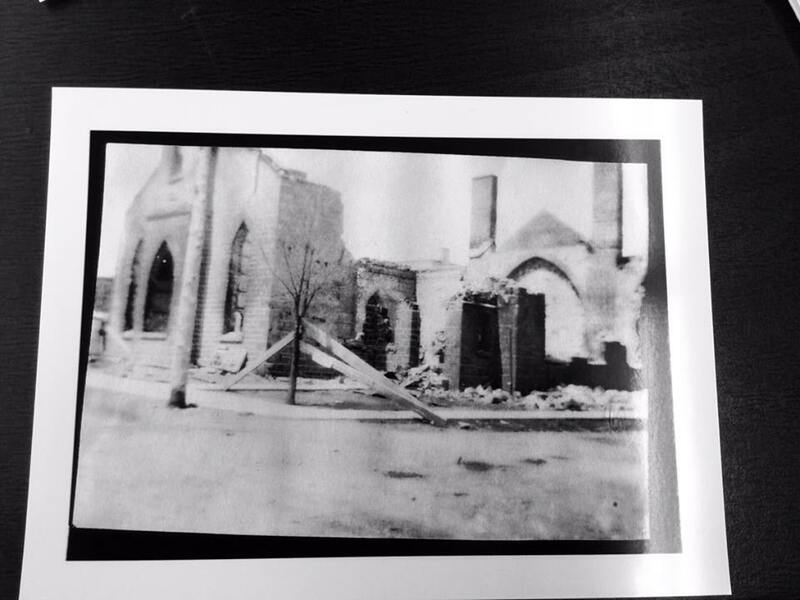 Many feared that Zion Church would not be rebuilt, but it was rebuilt between the years of 1911-1912. The Zion Presbyterian Church was amalgamated with the United Church later on in 1966. 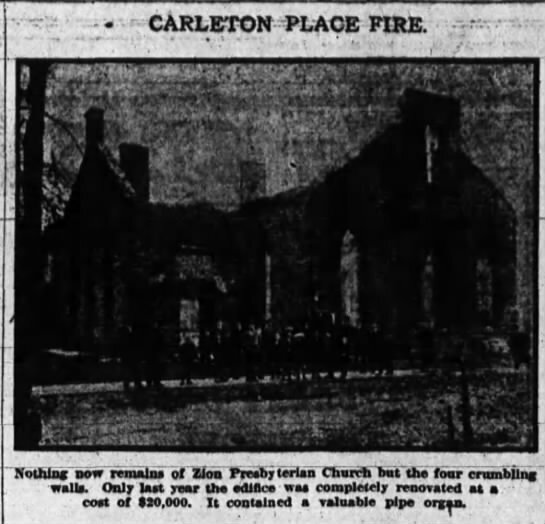 This was one of the the worst fires in Carleton Place except for 25 years previous when MacLaren’s Lumber lost $300,000 of lumber.There were no fatalities or serious injuries, and the loss was entirely financial. 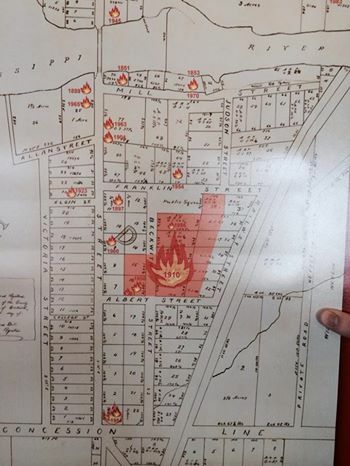 May 17th, 1910 will be a day the town of Carleton Place will never forget. Even though some wanted to blame it on the coming Halley’s Comet- the fact it passed a day later nipped that gossip in the bud pronto! This picture shows where the fires were.. Actually according to Jayne at the museum they went even farther than what was marked.